Lock in a great price for Casa Mazunte Tierra Viva – rated 9.2 by recent guests! 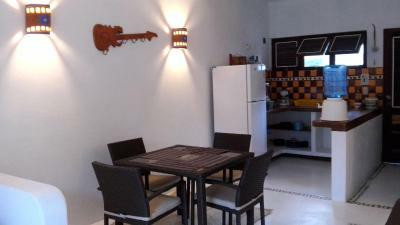 location, kitchen in quadruple room to cook and have lunch and breakfast at home everyday. cleanliness and Paddys attention to our everyneed and question. The Casa Mazunte Tierra Viva is a work in progress, meaning they are in process of building a restaurant, pool, lounging area and adding some character. However, it is already a very nice place to stay. Our room was large, clean with a very large window that kept the room bright (but not hot thanks to the shade). Very quite property and air-conditioning available if needed. This is one of the best situated hotels in Mazunte. 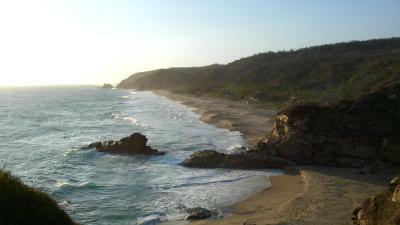 It is located just off the main road that takes you to Playa Rinconito. 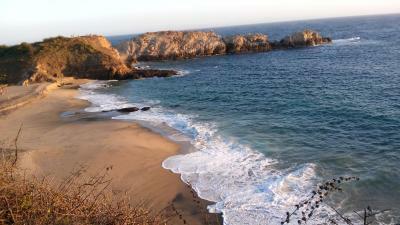 The beach, the best restaurants, and the road to Punta Cometa are all a few steps away. The communal kitchen was also a nice perk and good opportunity to meet other friendly travelers. Staff is also very friendly and accommodating. I would stay here again and look forward to the additions. We found the accommodation to be excellent. Paddy, the owner, was quite helpful and attentive to our needs. The place was comfortable and quite. The view from our room was lovely. Location is realy nice, they do have hot water, and it was quiet. Spacious bungalows and close to the everything yet quiet! Property was kept very clean by Lorraina the house keeper. She did a great job. Carlos who was manager at the time was on site and always available. Both of them were very friendly and nice. The room had white floors and nice beds and linens. Everything worked well. 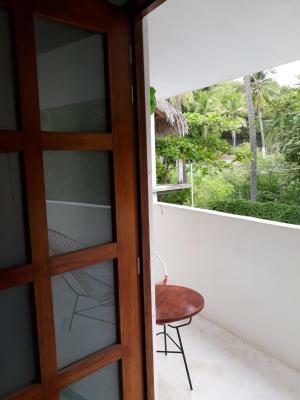 The property is very close to the beach and restaurants so it was convenient. Excellent location near everything, but quiet! 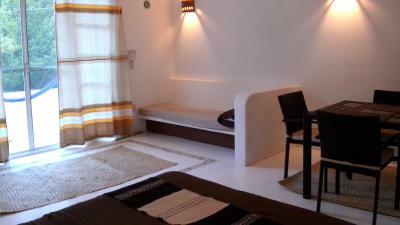 Comfortable and very clean room with AC for hot afternoons, Access to shared kitchen. Hosts were very friendly and helpful. The ground-floor rooms with private kitchen balcony/patio are best for families. Great location. 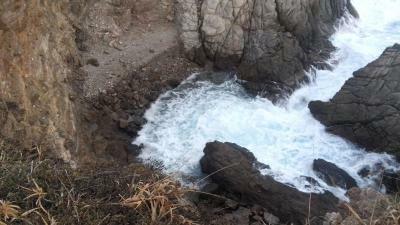 AC is great, Cold and hot water which is not easy to find in Mazunte. Very friendly staff. Clean. Bungalows Tierra Viva offers fully equipped bungalows located just a 2-minute walk from Playa Rinconcito beach in Mazunte. 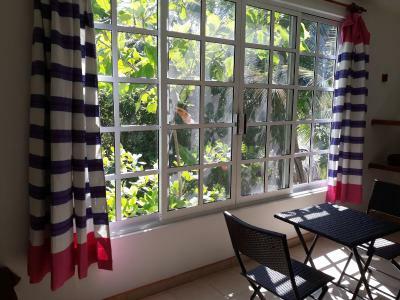 The property has beautiful views of the mangroves surrounding it. 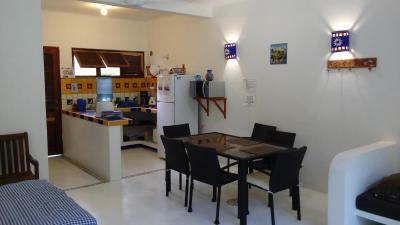 Each bungalow here features a seating area and a full kitchenette with a fridge and kitchenware. They have a private bathroom with a shower and free toiletries. Guests at Bungalows Tierra Viva will find a wide range of restaurants, bars and small shops within a 5-minute walk, while the Punta Cometa scenic outlook is just a 25-minute hike away. The popular town of Zipolite is just a 5-minute drive away, and guests can reach Huatulco International Airport in 50 minutes by car or taxi. This is our guests' favorite part of Mazunte, according to independent reviews. 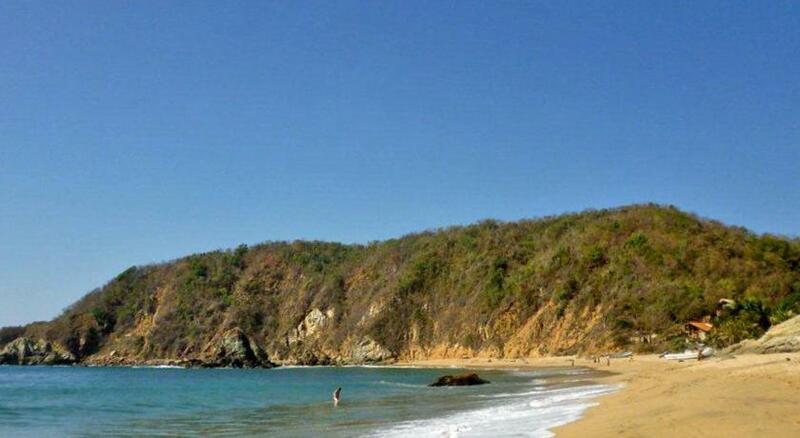 This property also has one of the top-rated locations in Mazunte! Guests are happier about it compared to other properties in the area. 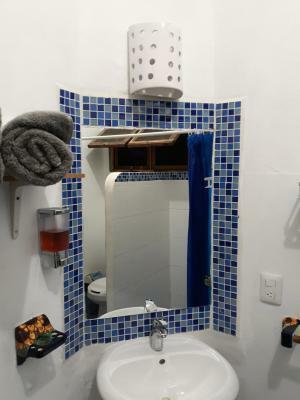 This property is also rated for the best value in Mazunte! Guests are getting more for their money when compared to other properties in this city. 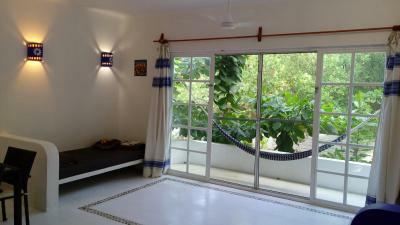 When would you like to stay at Casa Mazunte Tierra Viva? This bungalow has a balcony, kitchenware and microwave. This bungalow has a stovetop, seating area and sofa. Located on the second floor, this comfort room is decorated with Mexican textiles and furniture. House Rules Casa Mazunte Tierra Viva takes special requests – add in the next step! Casa Mazunte Tierra Viva accepts these cards and reserves the right to temporarily hold an amount prior to arrival. Please note that air conditioner service has an extra charge of $ 10 USD in Triple confort room. Please inform Casa Mazunte Tierra Viva of your expected arrival time in advance. You can use the Special Requests box when booking, or contact the property directly using the contact details in your confirmation. We were suppose to have a little room with share kitchen but when we arrive we change for a bigger room with a private bathroom and kitchen, obviously we pay more for this but it was the good option, we enjoy the little terrace, the room was nice and clean and the kitchen was well equiped. Good location and owners was nice and helpful. When we arrive there was no internet so they give us there box until the problem was resolved. We can park our car. Owner Paddy was lovely, nothing a problem, went out of her way to make sure our stay was enjoyable and hassle free, shows a genuine regardfor her guests. 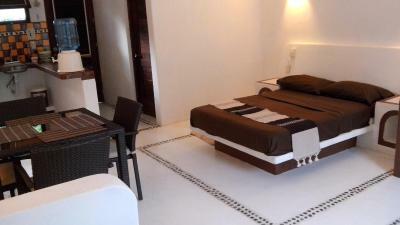 Rooms spotlessly clean and great location to beach restaurants. We have an evasive and scheming toddler and god-forbid she ran out of the room, we would have felt a little more at ease if there was second guardrail on the stairway bannisters. Patty was really nice and available to give us all possible suggestions. The apartment was perfect. 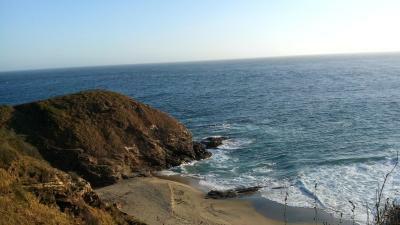 In the green, close to the beach and to all activity in Mazunte. We will come back for sure. Patricia was lovely, charming and very warm. She went out of her way to make you feel like family. When I was sick, she took me to the doctor and bought me herbs to help me feel better. She was professional and took care of every detail so that our stay was very enjoyable. Very friendly owners who were attentive to all the details. Very helpful and gave great information on the area. The outside area could be more developed. Cool, comfortable rooms, hot water (a luxury in this area), strong wifi. Best beds on our trip! Location was great, near restaurants and the beach but not noisy at night. Hosts were lovely. Like others said before, the outside areas would need a bit more attention to detail and the hangout options are somewhat limited. The back screen doors should have a lock on them. We could not lock the screen doors at night when we were sleeping. Although the property is enclosed by a fence and wall it feels a bit insecure to not be able to lock the screen doors at night. Paty, the owner, is so lovely. The hotel is in a great location (30 seconds to the beach), with lots of great restaurants around. The beds were very comfortable. A great stay and would come back in a heartbeat! The shared kitchen is right outside the door in the hallway, which was on rare occasion a little noisy. But the owners plan to move it out into the patio area, which will solve that issue. There is no ocean view from the rooms, but there is a nice rooftop with some view/ocean breeze and hammocks (no children allowed up there). They have a great location, very close to the beach and the restaurants. The room and the view we had were beautiful and the owner of the hotel cares about every detail.